Broad Green’s Ward Cllr’s Stuart Collins, Mike Selva and Manju Shahul-Hameed working with local residents, West Croydon Voice and The Broad Green Big Local have used part of their Community Ward Budgets to celebrate the old Village Area, with 56 road signs using the wording “Historic Broad Green Village” above each road name. Broad Green Ward has a diverse cultural population, with many people proud to live in the area, it is hoped that the celebration of the Ward’s village history and the recent Council investment in the area can help build on that pride and sense of community. It may not be obvious now, but Broad Green was once a rural hamlet on the road between London and Croydon – a cluster of houses round a village green. 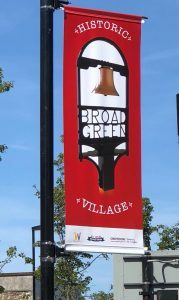 As far back as 1491 it was mentioned in documents, originally spelt “Brodegren” or “Brode Grene”, meaning “the broad village green” (in Middle English). The green was a triangle of open land between what is now Handcroft Road, London Road and Sumner Road. To the east of it was Croydon Common and to the north was the great North Wood. Sadly, there is now no trace of the actual village green: this was enclosed and built over in the mid-Nineteenth Century. To imagine how it would have been, stand by the Broad Green bell and look south towards Croydon. To your left there would have been a few cottages along what is now London Road (east side). To your right, there would also have been cottages along what is now the west side of Handcroft Road. In the centre, the green would have been open grassland, with the villagers’ animals grazing on it. Along the road in the days when Britain was a mainly rural place, and people travelled on foot or by horse, regular resting and feeding stops were needed on the way. All across the country, villages and hamlets like Broad Green grew up along the roads between larger towns. For 500 years or more Broad Green had an inn or pub called the Half Moon at the northern corner of the green, it was a coaching inn where people would stop to rest on their journey, with stables for the horses. 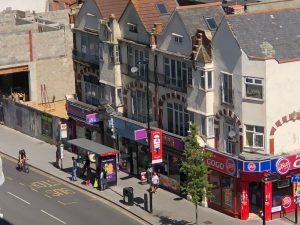 To imagine it, stand by the Broad Green bell and look north towards Thornton Heath: the Half Moon stood on London Road at the junction with Dennett Road. There is now a block of flats on the site. 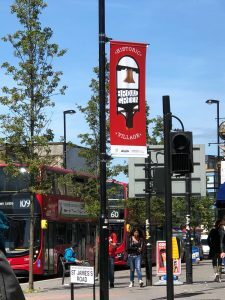 Although now a densely populated urban area within a large London borough, Broad Green can still be proud of its village origins. Unlike many other historic villages, however, very little visible evidence remains of its rural past: it is therefore all the more important to publicise and document the changing history of the area and to celebrate Broad Green Village as part of the rich diversity of Croydon. It would be great one day to hear a Croydon resident proudly state “ I‘m from the Village, Broad Green Village”. These signs are a small first step towards that goal and will be followed by further regeneration and business support benefitting local residents and traders alike.